Batman isn't special. Sure, he's got tons of money, but beyond that, he doesn't have any powers. Not a single one. And yet he's able to keep pace with the rest of the Justice League. He proves that all it really takes to be a superhero is some guts and few ninja moves to back it up. Heck, you could be Batman if you had access to an awesome costume (and maybe a few cool gadgets)! You have guts, right? You want to save the world from impending doom, right? You want to team up with Wonder Woman! You want to give The Flash a high-five after you beat up some bad guys! Well, then what are you waiting for? You could step into the role of the billionaire superhero from the Justice League. You just need to start with this adult plus size tactical Batman costume and go from there! That's right! 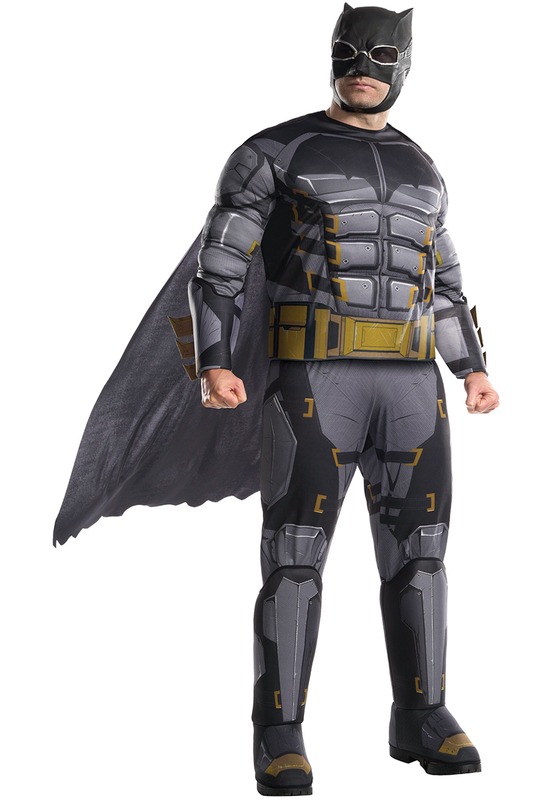 Becoming the iconic superhero is as easy as wearing this Batman costume. It comes with details that any fan can appreciate. The jumpsuit comes with muscle padding in the chest and arms, giving you a buff look like Bruce Wayne. It also has printed armor details, which make it look tough enough to take a hit from Steppenwolf. It also has a printed utility belt around the waist (Batman would never be caught without it). The legs of the suit have attached boot covers at the bottom, so you can wear your favorite pair of shoes with this outfit. And, yes, this costume totally comes with a cape and mask! The mask even adds a slight military twist to the classic Batman look. Of course, this costume doesn't come with billions of dollars, so you won't be able to have Batman's full array of expensive gadgets. It's a start, though. Just be sure to call up a few of your friends to dress up as Superman, Wonder Woman, The Flash, Aquaman, and Cyborg! That way you can form your own Justice League this year!